This instrument was commissioned by The Australian Brandenburg Orchestra for use as both a solo and continuo instrument and was in fact the first of ours to be delivered (in 2003) to Australia. Although we have built a number of chamber organs over the years, this one was slightly different in a number of respects. As can be seen from the specification, the instrument has a Principal 4. This is not unusual in itself, but normally the lowest six notes or so are derived from the 4ft Flute as open pipes take up too much room. In this instance, a full compass Principal was required, so the lowest notes of the Principal are of wood and mounted in the base of the instrument. Another requirement was that the standard pitch of the organ should be A415. This, together with the generous scaling which was suggested, made for a challenge in constructing an instrument which was still portable. As the organ is used at modern pitch as well, the keyboard can be transposed to play at A440. The pipework can also be tuned to A430 when desired. To make the instrument more flexible, all the stops are divided bass and treble. For transportation, the keyboard can also be retracted. The Australian harpsichord maker, Marc Noble, who undertook the decoration of the casework, also designed the carving for the pipeshades and suggested the original scheme of the pipe facade. The organ has now been used for a number of concerts and has proved equally suitable as a continuo instrument as a solo instrument. 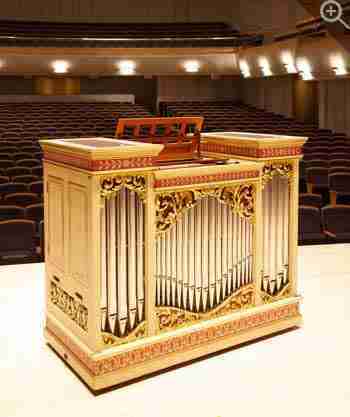 View the Specification of the Brandenburg Orchestra's organ (completed 2003) and pipe scales.